Achmad Humam Hamid, a sociologist and human rights campaigner from Syiah Kuala University in Aceh province, said there was little difference between the main contenders. 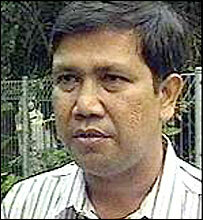 "None of the candidates have any vision at all about how to solve the problems in Aceh," he said. "They talk about security and democracy, but when you ask them for more details they don't have any answers." Security is a major concern for people in Aceh. The province has suffered from decades of violence between the Indonesian security forces and separatists from the Free Aceh Movement (Gam). At least 10,000 people have been killed in the conflict, and civilian rule only returned in May after a year of military control. "All the candidates agree there is an improvement in security," said Achmad Humam Hamid, although he added that many Achenese themselves thought it was too early to assess whether progress had been made. On issues other than security, there was also little to separate the main presidential contenders, he said. "We don't really know their policies, but there are no clear differences," he said. A lack of obvious distinctions means there is even more pressure on individual personalities, and the current front-runner, Susilo Bambang Yudhoyono, is a controversial figure in Aceh. As security minister under President Megawati, he was in charge of the decision to impose martial law in the province in May 2003. According to Achmad Humam Hamid, it is difficult to know whether this decision will gain or cost him votes among the Acehnese electorate. At least Susilo Bambang Yudhoyono has visited the province to campaign. "As far as I know, only three of the candidates have actually been to Aceh to campaign," said Achmad Humam Hamid. Overall, he held out little hope that Indonesia's first direct presidential election would change much for the people of Aceh - regardless of who wins. "Personally, if the candidates can deliver what they say they are going to, it would be wonderful," he said. But he said that, in reality, the targets they had set themselves were simply unrealistic.